We’re Gonna Make It Through. Here’s How. The election countdown has begun. In fewer than 48 hours, commercials will return to peddling prescription meds and social media feeds will return to pictures of what people are eating. In order to make it to this promised land, however, we first have to survive Nov. 8. To help you through, Flatland has put together a few survival tips. Help us spread the word — after all, united we stand, divided we fall. Uptown Arts Bar: The party, at 3611 Broadway St., starts at 6:30 p.m. for those 21 and over. Youngins are allowed as long as they are accompanied by a parent. There will be $2 wells, $8 pizza and $4 Jameson all night. Julep: Julep, located in Westport, will be streaming the election results starting at 6 p.m. Plus, show up with an “I Voted” sticker for a free shot. AMC Theatres: AMC will stream CNN in two separate theaters, one “red” and one “blue.” The event is free, but you must reserve tickets and be a Stubs member (AMC’s membership) to enter. Each member can bring two guests. The “blue” theater will be at AMC Barrywoods 24 and the “red” theater will be at AMC Studio 28. The Ship: The Ship, at 1217 Union Ave., is hosting an “End of the World Watch Party” starting at 6 p.m. The event features free admission and snacks. Pizza 51: Pizza 51, at 5060 Oak St., is hosting ElectFest from 7-10 p.m. with free pizza. If the election is close, Pizza 51 will stay open until midnight. Combine all the ingredients, except the sparkling wine, in a cocktail shaker with ice and shake vigorously. Strain into a sugar-rimmed glass, and top with sparkling wine. Combine all ingredients in a mixing glass. Top with ice and shake vigorously. Strain into a chilled glass filled with ice. Muddle berries, add ice, add remaining ingredients. Stir and pour over ice. — Recipes courtesy of Omni Hotels and Resorts. Escape the conspiracy theories by heading to the middle of the woods or that mysterious dead zone where all of your calls drop. Take time today to grab some groceries and refuel your gas tank. 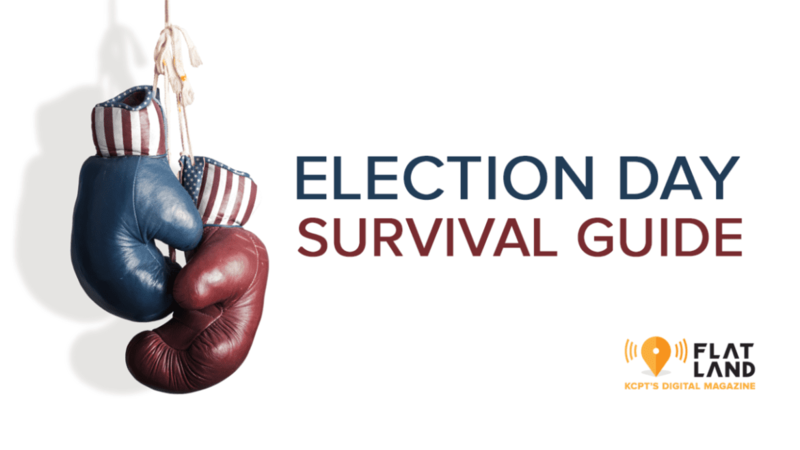 We can’t predict what Nov. 9 will bring, but we can predict you’ll be too tired for errands after all the election night shenanigans. It’s going to be a long night, so go vote, make your evening plans, then sit back and survive the ride. — Tiffiney Baumgarden is a freelance social media manager for Flatland KC who believes in hometown pride, entrepreneurship and endless possibilities. Follow her on Twitter @TiffineyInk or email her at KCPTFreelancer@KCPT.org.